On April 18 Geoffry Mutai finished the Boston Marathon in 2:03:02, which is the fastest a human has ever run 26.2 miles. 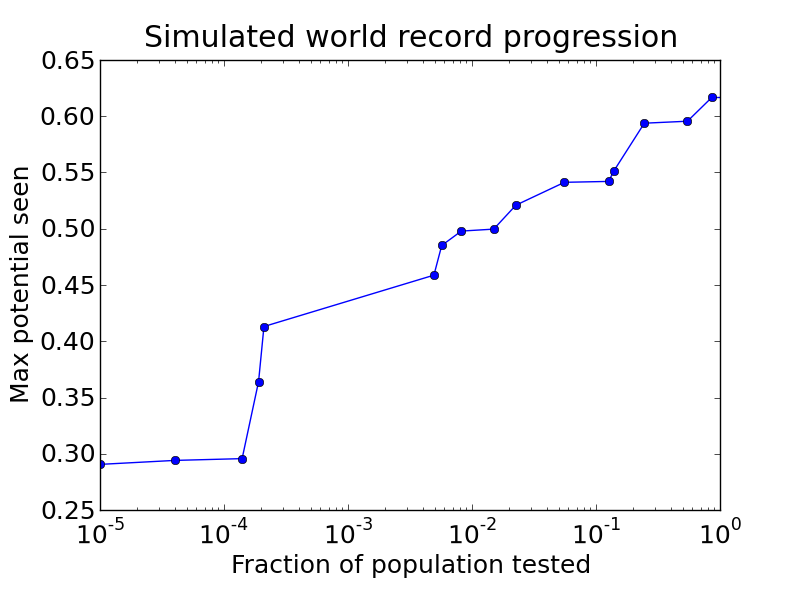 This remarkable performance raises the question: when will we break the 2-hour barrier? Most of these factors have a large component that is inherent, they are mostly independent of each other, and any one of them can be a limiting factor. That is, if you are good at all of them, and bad at one, you will not be a world-class runner. There is only one way to be fast, but there are a lot of ways to be slow. Yes, that's right, I just reduced a person to a single number. Bring in the humanities majors lamenting the blindness and arrogance of scientists. Then explain to them that this is supposed to be an explanatory model, so simplicity is a virtue. A model that is as rich and complex as the world is not a model. In this kind of genetic lottery, it takes a long time to hit the jackpot. 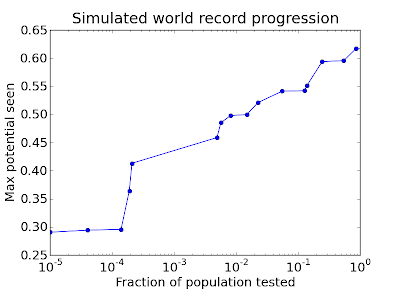 And that's important, because it suggests that even after 6 billion people, we might not have seen anyone near the theoretical limit. But the pipeline that selects and trains runners behaves, in some ways, like the model. If a person with record-breaking potential is born in Kenya, where running is the national sport, the chances are good that he will be found, he will have opportunities to train, and he will become a world-class runner. It is not a certainty, but the chances are good. The red line is the target: 13.1 mph. The blue line is a least squares fit to the data. 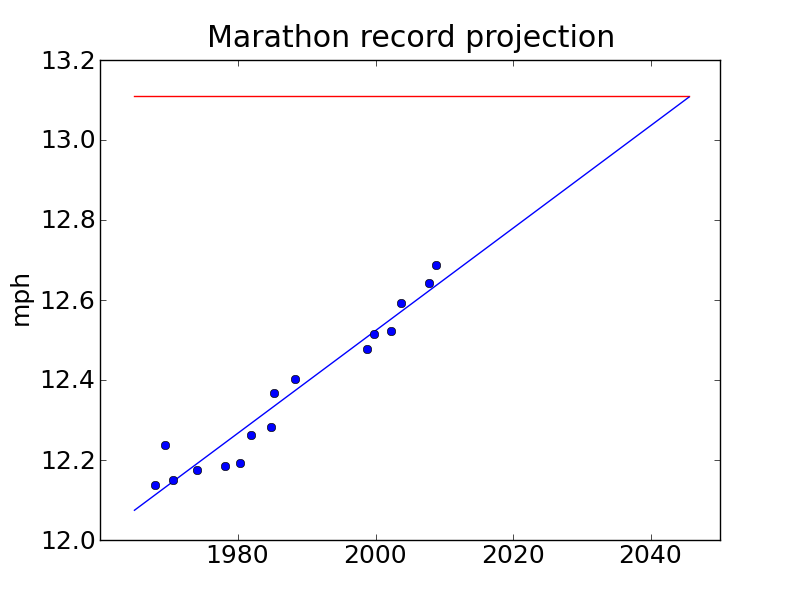 So here's my prediction: there will be a 2-hour marathon in 2045. I'll be 78, so my chances of seeing it are pretty good. But maybe that's a topic for another article. I watched a debate recently between William Lane Craig and Lawrence Krauss on the topic "Is there evidence for God?" Dr. Craig argued the affirmative; Dr. Krauss the negative. Since their names are monosyllabic, Germanic, and alliterative, it might be hard to keep them straight. I will call them Affirmative and Negative. P(H | E) > P(H). In Bayesian terms, P(H) is the prior probability, that is, prior to taking E into account; P(H | E) is the posterior probability. This definition of evidence sounds reasonable to me, and I think it is uncontroversial. But Negative chose to refute it: "I will get to the fact that [Affirmative's] claim for what evidence is is not at all what we use in science nowadays. It doesn’t relate at all to what we use in science." I think I have a pretty good idea what we use in science nowadays, and I have no idea what Negative is talking about. He never explained. In his rebuttal, Affirmative replied, "This is the standard definition of 'is evidence for,' used in probability theory. And I’m astonished to hear [Negative] attacking logic in Bayesian probability theory as the basis for his argument." So am I. On this point I think Affirmative is basically right, but I do have one reservation. People often assume, incorrectly, that E is evidence for H if E is consistent with H, but in fact, that's not enough. Because the findings at the scene are consistent with the hypothesis that Oliver was at the scene, it is tempting to say that they are evidence for the hypothesis. In fact, they are not. The term P(E | G) is the likelihood of the evidence if the hypothesis is true. This is easy to evaluate. If Oliver left blood at the scene, that accounts for the type O trace. So P(E | G) is the probability that the other sample, from an unknown person, is type AB, which is 1%. P(E | NG) is the likelihood of the evidence under the hypothesis that Oliver is not one of the people who left blood at the scene. In that case, the blood was left by two unknown people. 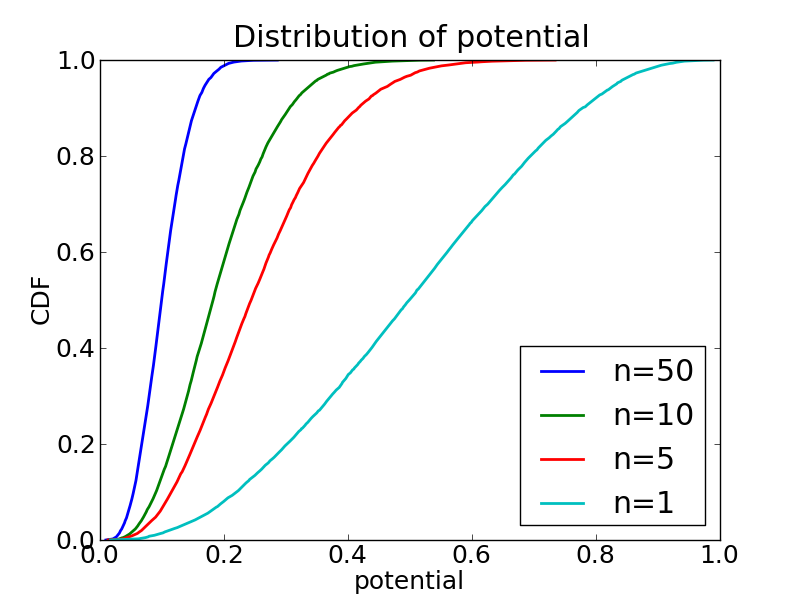 If we choose two people at random, the chance of finding types O and AB is 2 * 60% * 1% = 1.2%. that is, if the evidence is more likely under G than under NG. 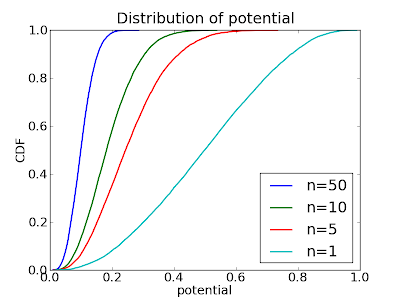 In this example the ratio is 1/1.2, which means that the posterior probability of G is slightly lower. So the evidence is mildly exculpatory. Surprised? So was I. To understand why, think about the evidence. In the local population, AB blood is rare, so the AB sample is harder to explain. If Oliver accounts for the type O sample, there is only one candidate to account for the AB sample. If neither sample is accounted for, we get two bites at the apple. And in this example, that makes the difference. The moral of this story is that evidence consistent with your hypothesis does not necessarily support your hypothesis. The evidence has to be more likely under your hypothesis than under the alternative. where NH is the complement of H. I think this way of expressing the requirement is clearer and less prone to abuse. To demonstrate, I will analyze one of the points of evidence proposed by Affirmative, the existence of contingent beings. He explains, "By a contingent being I mean a being which exists but which might not have existed. Examples: mountains, planets, galaxies, you and me. Such things might not have existed." He then offers a version of Aquinas's argument from First Cause. You can listen to it here (between 2:30 and 4:30) and read about it here. Based on this argument, he concludes "The most plausible explanation of the universe is God. Hence the existence of contingent beings makes God's existence more probable than it would have been without them." But I think he skipped a few steps. If E is the existence of contingent beings and G is the hypothesis that God exists, we have to evaluate both P(E | G) and P(E | NG). If Aquinas's First Cause is Yahweh as described in the Torah, then P(E | G) = 1, and it's hard to do better than that. But one of the standard objections to Aquinas's argument is that it provides no reason to identify the First Cause as Yahweh. Because we don't know anything about what the First Cause is (or even whether the concept makes sense), P(E | G) is just P(E); that is, the hypothesis has no bearing on the probability of the evidence. How about under NG? What is the probability of the universe if there is no god? 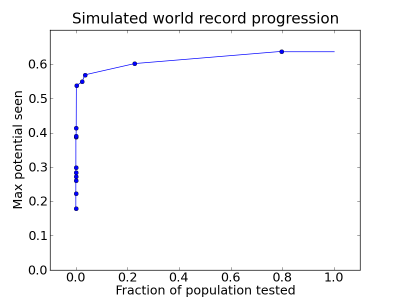 Bayes's theorem is a computational tool that is only useful if the right side of the equation is easier to evaluate than the left. In the case of Oliver's Blood, it provides a classic divide-and-conquer algorithm. But for the God Hypothesis, all it does is replace one imponderable with another. So I applaud Dr. Craig (Affirmative) for breaking out Bayesian probability, but I don't think it helps his case. As for Dr. Krauss (Negative), I am still waiting to hear "what we use in science nowadays." xkcd and I are in sync. In case you live in a cave, xkcd is a webcomic "of romance, sarcasm, math, and language," by Randall Munroe. Several times in the last year, the topics that appear in xkcd have been strangely synchronized with topics I am covering in class. The figure in the first frame is a survival curve. 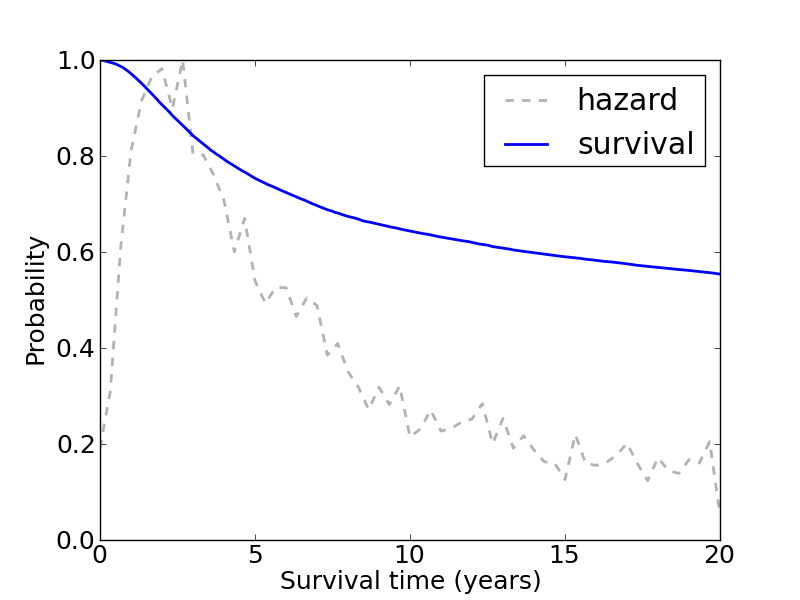 The solid line is the survival function, S(t), which is the percentage of people who survive at least t years. 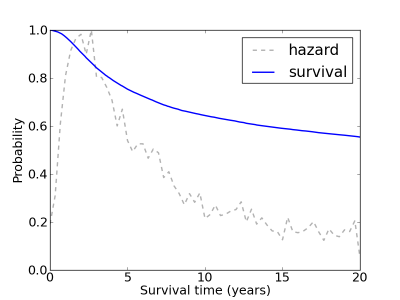 The dotted line is the hazard function, which is proportional to the fraction of deaths that occur during year t. In this figure the death rate is low immediately after diagnosis, highest after 5 years, then decreasing. The numbers in the second frame are survival rates: 81% survive at least 5 years and 77% survive at least 10. 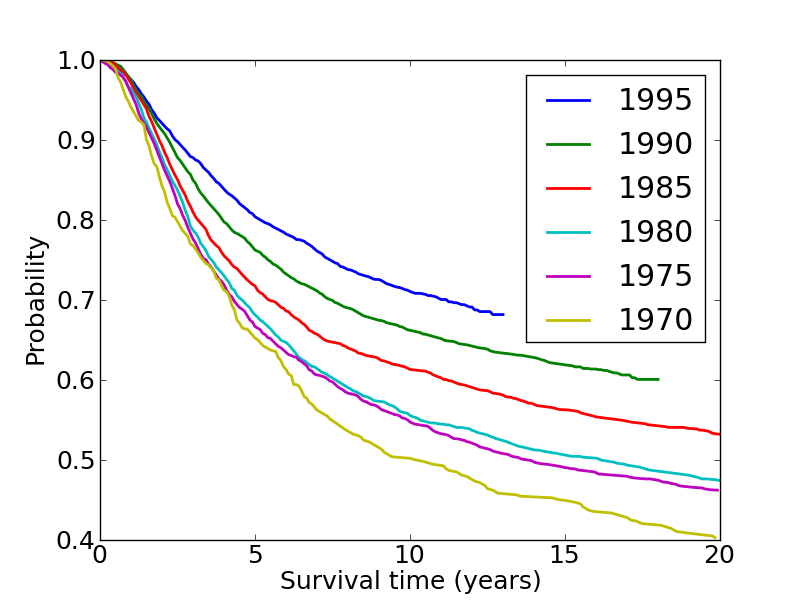 To explore this topic, and to demonstrate computational techniques in survival analysis, I downloaded data from the Surveillance, Epidemiology and End Results (SEER) Program run by the National Cancer Institute, which is one of the U.S. National Institutes of Health. SEER collects "data on patient demographics, primary tumor site, tumor morphology and stage at diagnosis, first course of treatment, and follow-up for vital status," currently covering "approximately 28 percent of the US population." I will use data from the SEER 9 registry, which covers Atlanta, Connecticut, Detroit, Hawaii, Iowa, New Mexico, San Francisco-Oakland, Seattle-Puget Sound, and Utah. 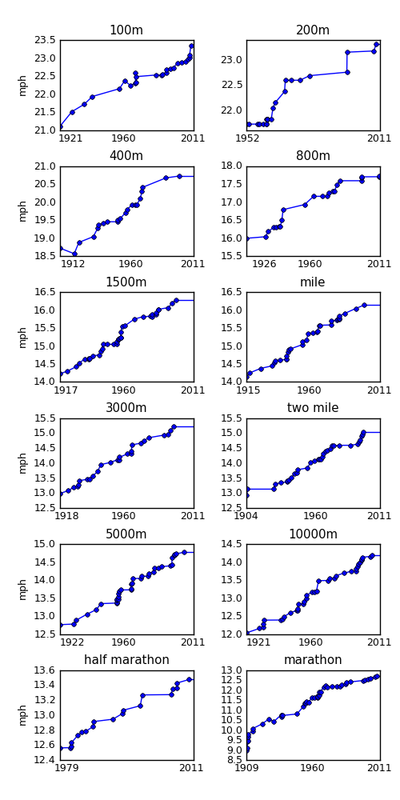 This dataset includes cases diagnosed from 1973 through 2007. As usual I wrote Python programs to read and parse the datasets. For my analysis, I select cases of breast cancer where the behavior of the tumor was classified as malignant, where the patient had only one primary tumor, and where the case has been followed up. There are 370263 records in this subset. I consider all causes of death, not just deaths due to cancer. This kind of analysis is most useful for prognosis, but because it includes other causes of death, it depends on patient characteristics like age, health, income, etc. Also, survival depends strongly on the stage of the cancer. The best way to deal with that problem is to generate curves that control for these characteristics. For this example, I limit the analysis to 19168 patients who were in their 30s at the time of diagnosis, but I don't control for other factors. 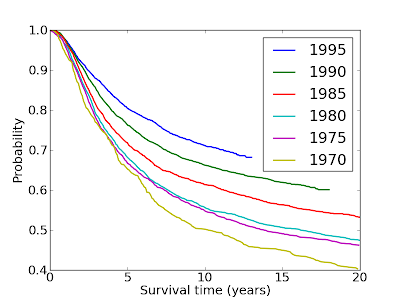 3) There is a systematic source of bias in this figure: the longest survival times are necessarily based on patients with earlier dates of diagnosis. In this figure, the leftmost data point is based on a cohort with a mean date of diagnosis in 1992. The rightmost data point is based on a cohort centered around 1982. 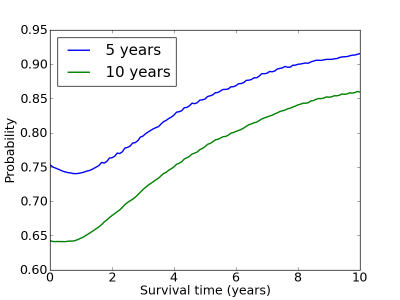 Since patient prognosis improves over time, the entire curve is too pessimistic for current patients, and it gets more pessimistic from left to right. So prognoses have been improving consistently. Part of this effect is due to improvements in treatment; part is due to earlier diagnosis. To distinguish between these causes, we could control for stage of cancer, but I have not done that analysis. At the time of diagnosis, the 5-year survival rate is 75%. 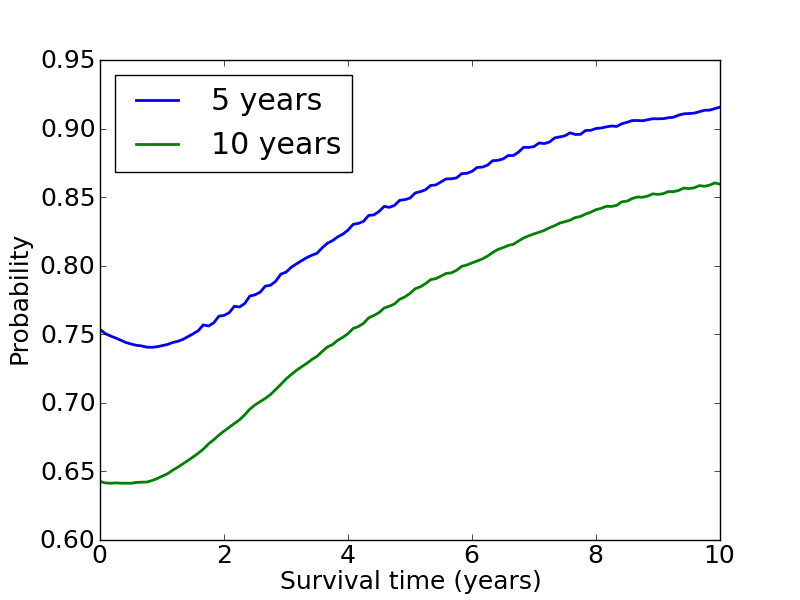 But for patients who survive 5 years, the chance of surviving 10 years is 85%, and if you survive 10 years, the chance of surviving 15 is 92%. In manufacturing, this property is called UBNE, which stands for "used better than new in expectation:" a used part is expected to last longer than a new part, because it has demonstrated its longevity. Newborn babies, cancer patients and novice motorcyclists have the UBNE property; the longer they live, the longer they are expected to live. So that's a reason to be optimistic. Note: Sadly, the xkcd strip might be autobiographical. I don't know details, but Munroe has indicated that he is dealing with an illness in his family, and several recent strips have been on medical topics. If my inference is right, I want to extend my best wishes to Mr. Munroe and his family. Data source: Surveillance, Epidemiology, and End Results (SEER) Program (www.seer.cancer.gov) Research Data (1973-2007), National Cancer Institute, DCCPS, Surveillance Research Program, Cancer Statistics Branch, released April 2010, based on the November 2009 submission.